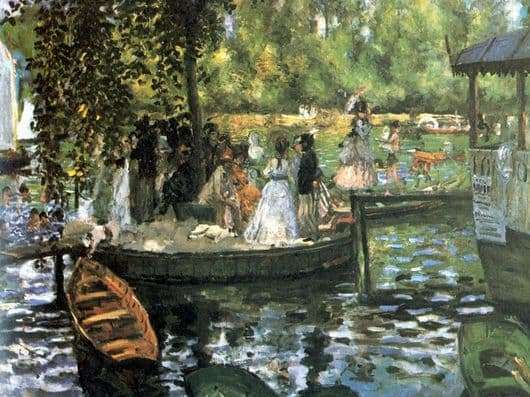 The painting was painted by Auguste Renoir in 1869. “Froggy” was called a cafe on the water, which was located on a pontoon moored to one of the banks of the French river Seine. This pontoon was connected to the shore by a small bridge for the passage. There were islands on the river, where the Parisians loved to relax. These places are described in the works of Zola and Maupassant. “Frog” was a place where girls of easy virtue met. They were called “frogs.” Here they came from the suburbs, along with hooligans and rogues. Sometimes they came alone, hoping to find clients. That men pecked, incredibly causing dresses were put on. Two painters Renoir and Monet in 1869 begin work on paintings with identical subjects. The styles were incredibly close. The cafe was depicted in both pictures from one point. Renoir more fascinated by the image of people, and Monet – nature and landscapes. It is important that Renoir with incredible thoroughness prescribes all the details of dresses. Renoir conveys the incredible beauty of light, which fancifully plays on the water surface. The painter did not at all strive to characterize the great depth of his characters. He did not try to reveal their psychology and inner world. In this sense, his art is limited. But it was he who told about completely unknown people with incredible warmth, enchanting gentleness and sincerity. He showed how charming youth is, handsome and graceful any man, how natural his quite ordinary movements are. Renoir was able to notice the fleeting expressions of the face, full of vividness, glitter of the eyes, the slightest shades of moods that they own.